Four students of Udayana University namely Tama (International Relations Student), Janis (Marine & Fisheries Science Faculty Student), Nara (Tourism Faculty Student) and Yudi (Law Faculty Student) had the opportunity to take part in the Our Ocean Youth Leadership Summit which is an integral part of Our Ocean Conference 2018 which lasts for 2 days, namely on 29-30 October 2018 at Nusa Dua Convention Center, Bali. 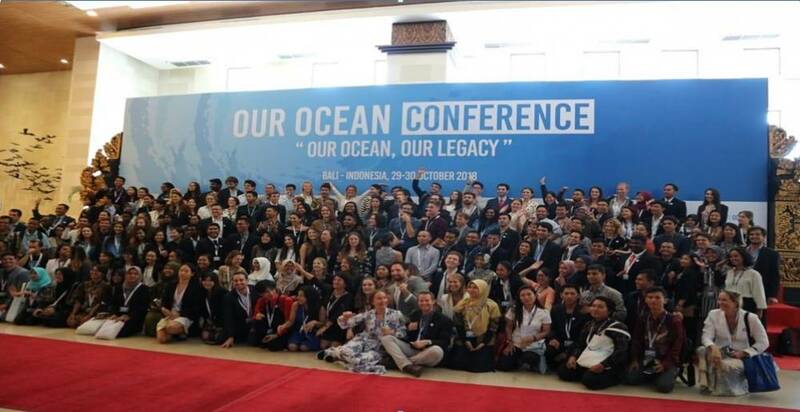 Our Ocean Youth Leadership Summit was attended by 189 participants from 52 countries with ages ranging from 16-35 years selected from around 500 registrants from 65 countries. The Minister of Maritime Affairs and Fisheries of the Republic of Indonesia, Susi Pudjiastuti, who opened the youth leadership activity directly stated that the role and participation of the young generation is very important to develop and maintain the sea. Indonesia and the world. Therefore, Indonesia must contribute and be committed to reducing the problem of plastic waste at sea. The focus of the Our Ocean Youth Leadership Summit is to gather ideas or ideas, projects and commitments from young leaders to safeguard the marine ecosystem from all kinds of threats that can damage it. The discussion of this activity also includes, a sustainable blue economy (sustainable blue economy), marine pollution (marine pollution), marine conservation areas (marine protected areas) and marimit (maritime security), sustainable fisheries) and climate change (climate change ) Furthermore, the activities of the Our Ocean Youth Leadership Summit will be held again in Norway which will also host our Ocean Conference 2019 on October 24-25 2019.